It’s no secret that I love Angel wings. I’ve added these angles wings in my home, some made of feathers and others made of wood. You can read about my obsession with wings HERE and HERE. 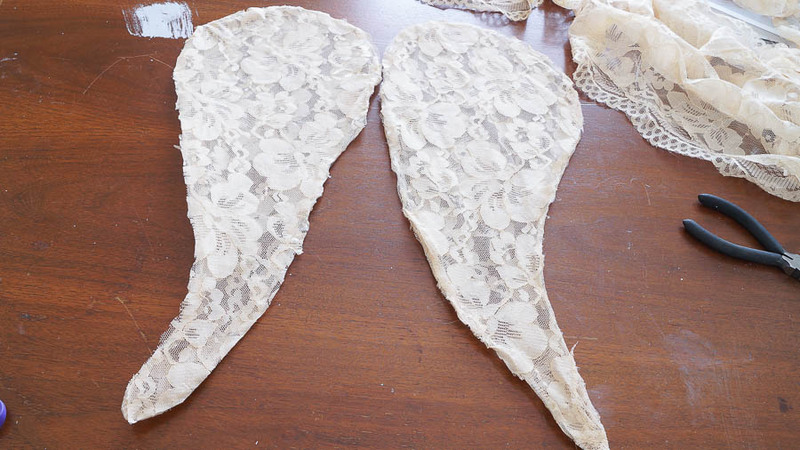 I’ve wanted a pair of French lace Angel wings for some time now. They’re hard to find, and when you do find them they are a bit expensive. 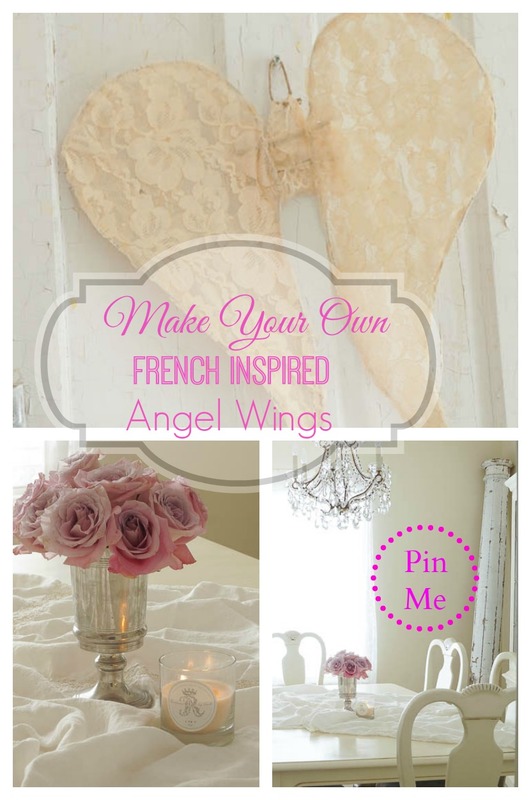 So I decided to make my own French inspired Angel wings. No surprise I always have lace on hand. 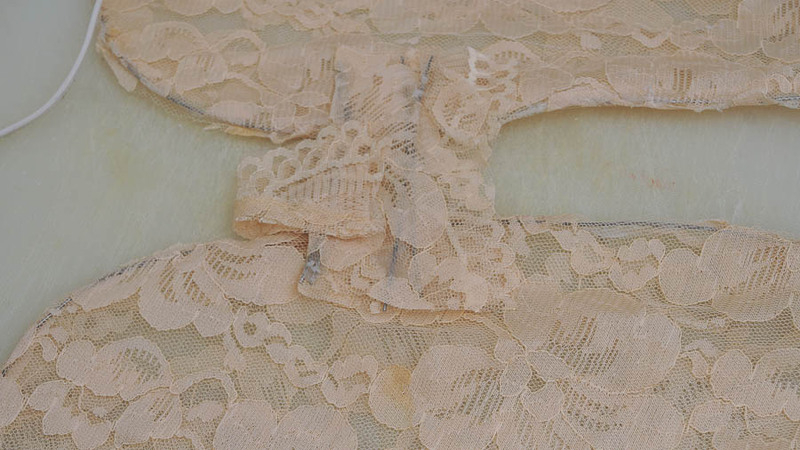 As I was looking for lace I found a beautiful piece that has a nice patina. 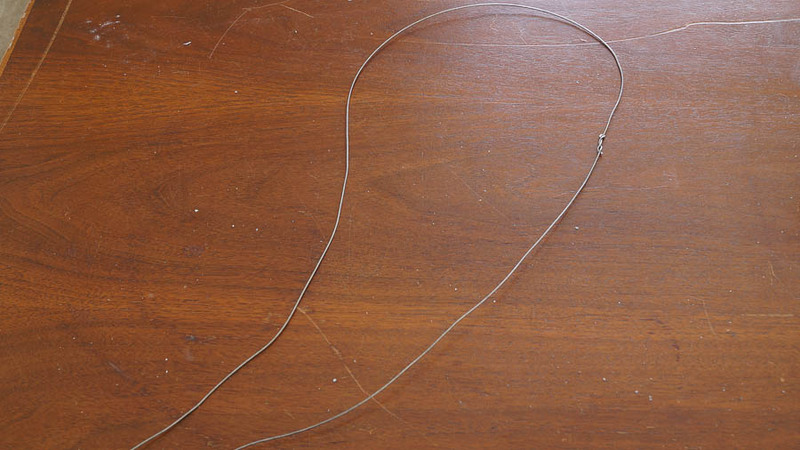 I also pulled out my 22 gauge galvanized steel wire. This photo was my inspiration, it’s from Jeanne D’ Arc magazine. You can see that’s an old pair, and they are not perfect, and neither are mine. The first thing you want to do is decide how big you would like your wings to be. Then start shaping your wings. I looked at this photo as I shaped my wings, I am a visual person so this was a great guide. Cut off the excess piece of wire. 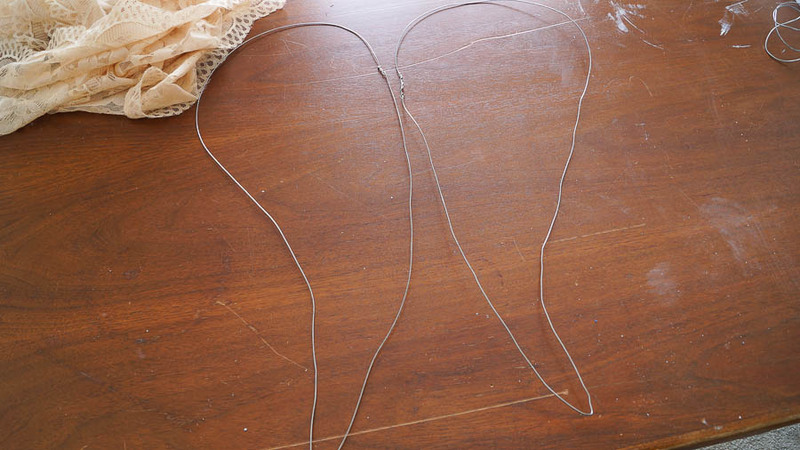 Then wrap the two wire ends together, be patient this is the part that takes the longest. And wear goggles and gloves, this wire is very sharp! 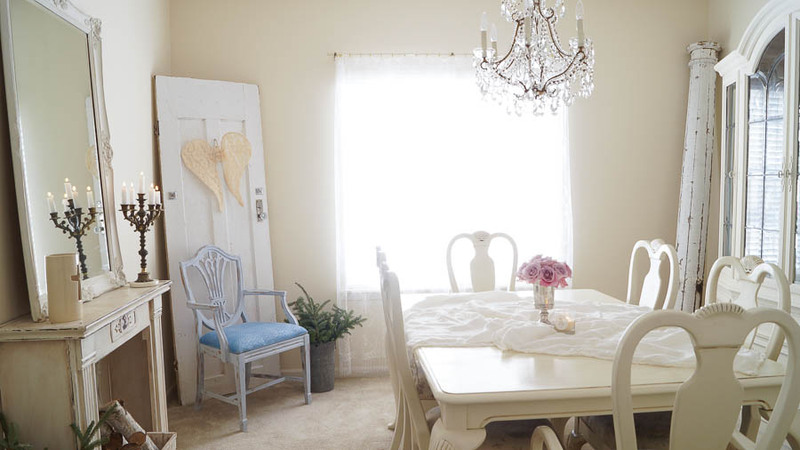 Here is my first, finished French inspired Angel wing. See how I wrapped the two wires together? I used a round nose plier. Here are my pair of wings, and as you can see they are not perfect. 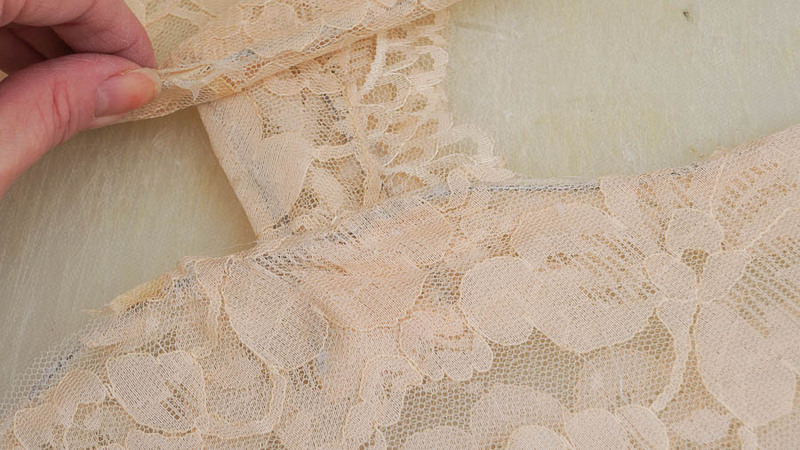 Next, I added the lace. 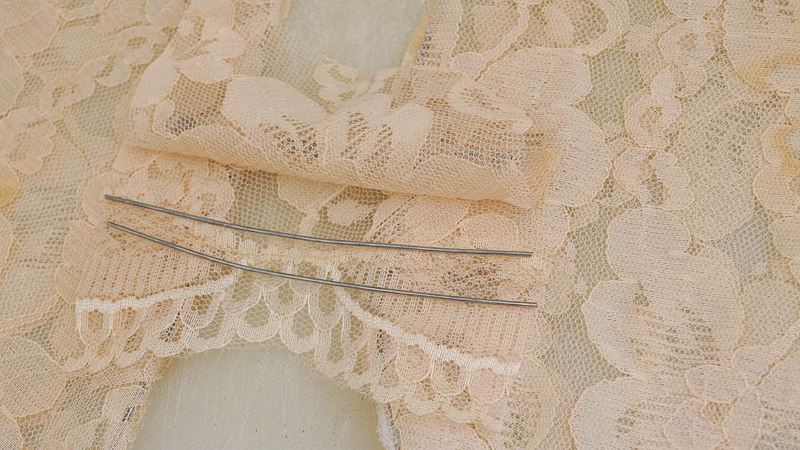 I placed a wing on top of my lace and cut around it. Make sure as you are cutting you hold the wing in place. It will move around quite a bit if you don’t. 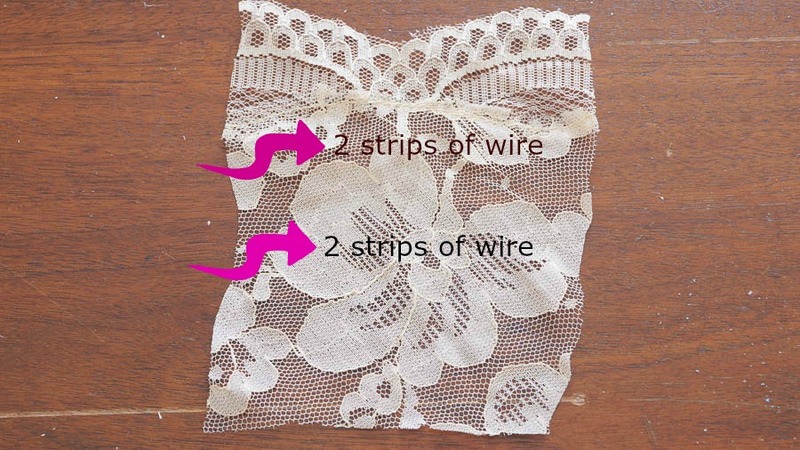 And also, make sure to cut a little extra lace. It’s better to have too much than not enough. You can cut off any extra after. After cutting a piece for the front and back it’s time to glue. 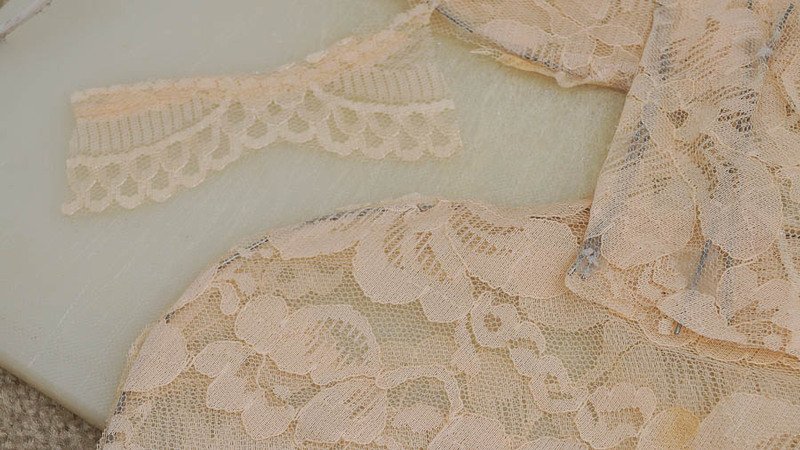 I am sure the vintage French Angel wings were not glued, but most likely sewn on. But I like instant gratification, and a hot glue gun does wonders! Always use caution with a hot clue gun. And do this project on a work surface, not a kitchen counter. 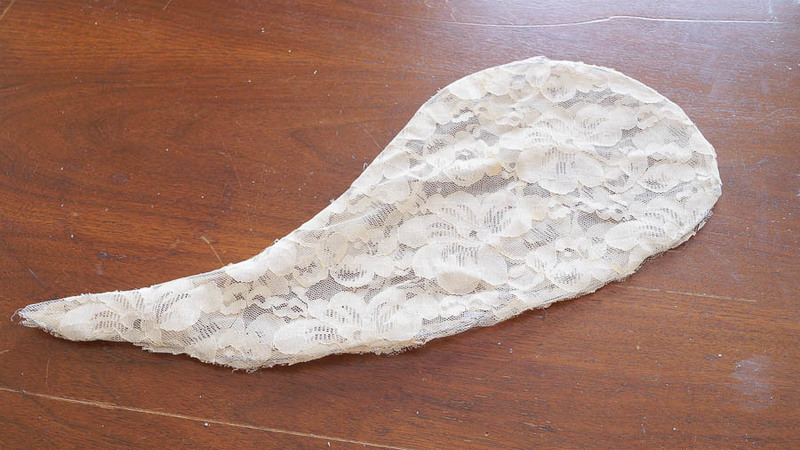 Don’t worry this French inspired Angel wing does fit on my fabric, it moved as I shot the photo. But I didn’t notice it until I was editing my photos. 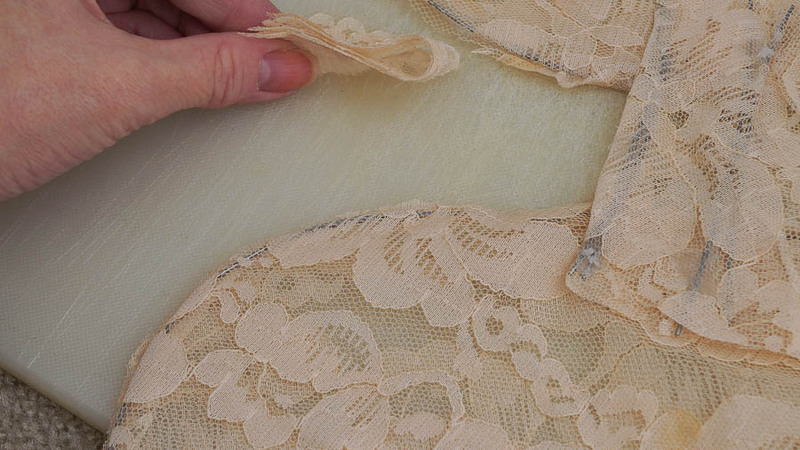 Glue one lace panel to the wire, trim off any excess lace. 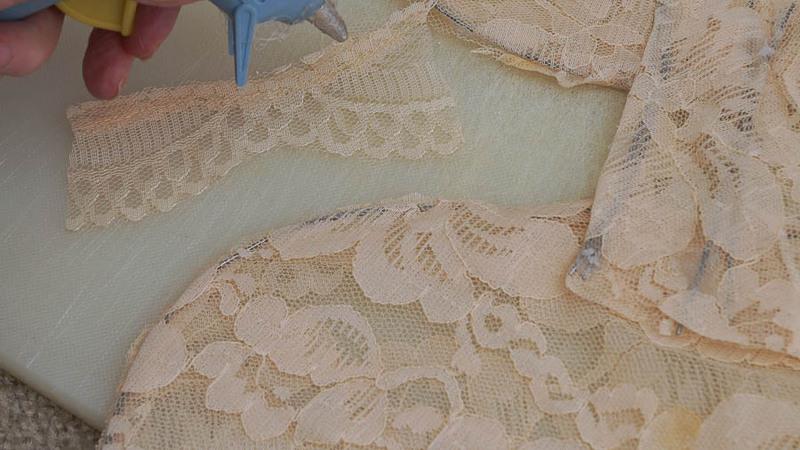 After the first panel is glued on, flip the Angel wing over and glue the other lace panel on. Here is a finished wing. You can see it’s a bit frayed on the ends. I left mine as it was, but if you don’t like that you carefully trim that all off. Here is the finished set. Your probably thinking….that’s great but how do you hang them? I was trying to figure that out and this was my solution. I took a piece of lace. 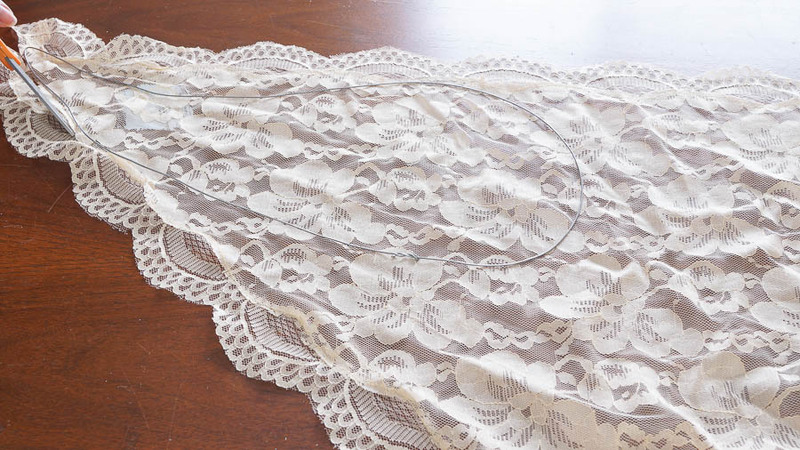 I cut four wires the length of this piece of lace. I glued two wires next to each other horizontally. Next I applied glue to close this little flap. I decided which side I wanted the back to be, and I glued this between the two wings. Then I decided to add a little loop so I could hang this better. Before folding this piece I added glue, then glued that piece my middle section with the wire. To hang this I used a little twine I already had, but you can use ribbon too. This was very easy to make. I have always wanted a pair, I had no idea of how to do this. But I made it up as I went along. It’s basically the way I create anything. Even was I was a little girl a pair of scissors, paper and glue would go a long way with me. I would make just about anything with those three things! 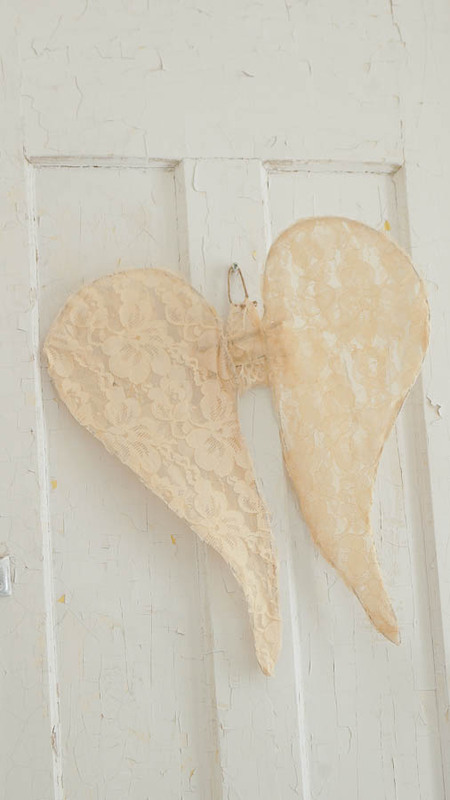 I love these French inspired Angel wings and I will keep these out all year long. These don’t have a season in my opinion. Here is our winter dining room. I still have some fresh greens from Christmas. They were out on our back porch, but I brought them into the house to enjoy inside. 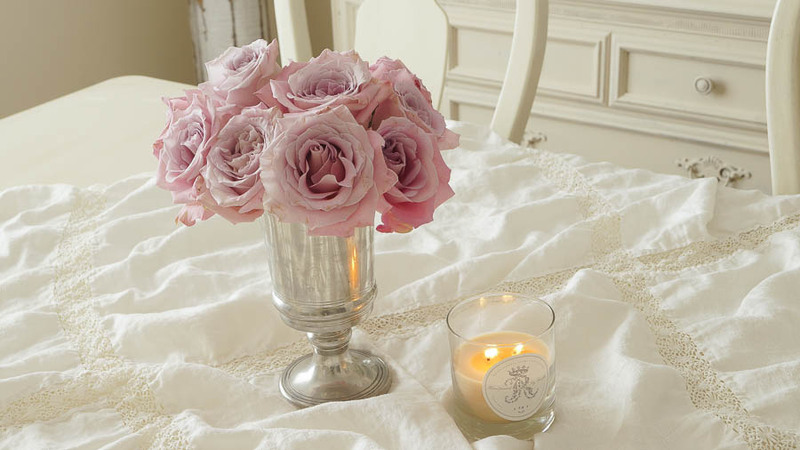 I always have fresh flowers out, especially rose’s. Living in the Midwest you need a little pick me up on these long, cold, and dreary days. Please make sure to visit all of these other beautiful blogs for Winter inspiration! Beautiful Anne. Love these. 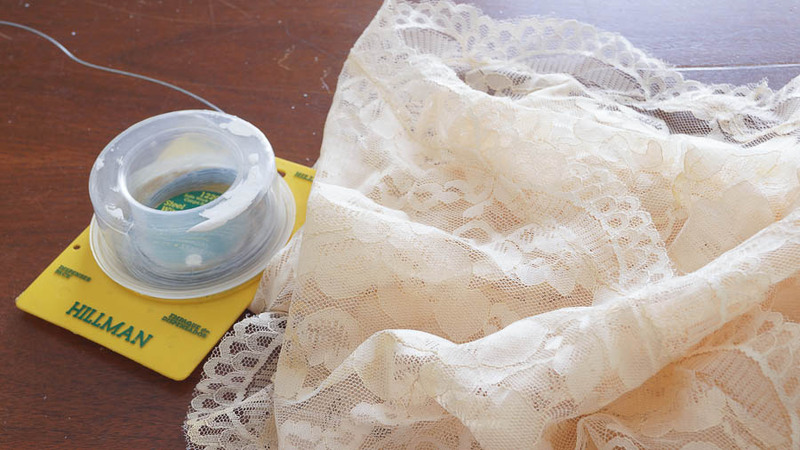 I like the idea of the glue gun instead of sewing. Much faster and easier I am sure. Wonderful project. I have always wanted a pair ever since first seeing them in Jeanne dArc but never thought to attempt making them myself. I am definitely going to make a pair now – thanks for showing how to do it. 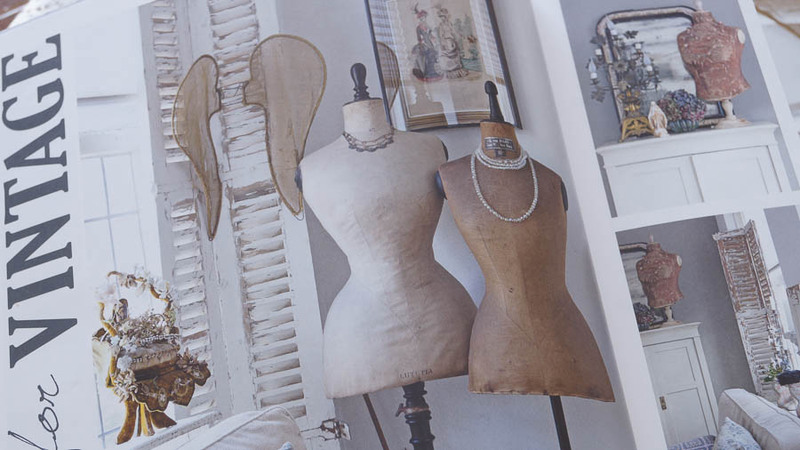 I also just saw an article on your home in the Spring issue of Vintage Style magazine titled Building Character – Congratulations!!! Me too Liz, and I knew I could figure out a way to make these.Thank you so much! Being featured in a magazine was a long time dream of mine. Those are beautiful and like the use of the glue gun,thanks for the post,i think mold the wire will be the hardest,but i will see. Yes Marlene shaping the wings is the hardest part of this project.But if you have a photo in front of you as I did, it makes it easier. Anne these are so romantically beautiful! Kudos to you for figuring out how to make these just from a photo. These are so lovely and so YOU, Anne! You are so sweet Sharon! oh anne- those wings are precious! Milles merci ! Je suis super contente , vous avez un blog est une magnifique maison . Thank you, Anne ,for such an inspirational idea! My daughter just passed away suddenly two months ago and it has been such a difficult journey, thus far, for me. But seeing this project has inspired me to get up and “do” it for the love of my daughter. She was my angel when she was born and continued to be throughout her 39 years. She was an exceptional you woman. I hope mine turn out to be as lovely.